Tayto Cheese & Onion are Ireland’s No.1 crisp pack, and are packed full of scrumptious Irish Grown Potatoes, cooked in 100% Sunflower Oil and seasoned with our own secret cheese & onion recipe! Tayto Salt & Vinegar, which are fingerlickingly good, are cooked in 100% Sunflower Oil and seasoned with the finest salt & vinegar ingredients. 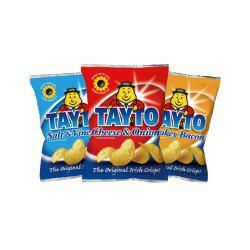 Tayto Smokey Bacon – the streaky one of the pack! You know that familiar flavour of freshed cooked bacon on a full Irish Breakfast!! – well try Tayto Smokey Bacon now – It’s sure to sizzle your taste buds!